"The thing with painting is that it's really slow. The more you look, the more you get, and I like making people really have to look." 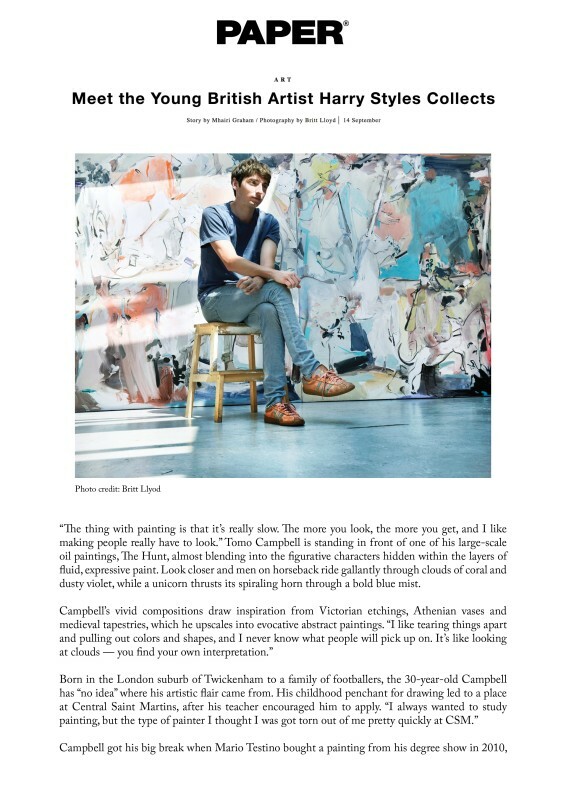 Tomo Campbell is standing in front of one of his large-scale oil paintings, The Hunt, almost blending into the figurative characters hidden within the layers of fluid, expressive paint. Look closer and men on horseback ride gallantly through clouds of coral and dusty violet, while a unicorn thrusts its spiraling horn through a bold blue mist. Campbell's vivid compositions draw inspiration from Victorian etchings, Athenian vases and medieval tapestries, which he upscales into evocative abstract paintings. "I like tearing things apart and pulling out colors and shapes, and I never know what people will pick up on. It's like looking at clouds — you find your own interpretation."